Hi guys - just a quick update. - Pat's family let us know that there will be a memorial service for him on July 12th in Sacramento, so we have a bit more time to put together something right. - I've spent a lot of time reading and collating everyone's thoughts and posts about Pat and laying these out in a memorial booklet to get printed. Will probably end up being about 40 pages. I've got in touch with 4 local printers in Sacramento to see what is possible and how many copies we can get made. I will post up some work-in-progress images of the layout soon for you all to see! - If you have any more thoughts or memories you would like me to include, please post up / send to me by ASAP -> THIS FRIDAY LATEST. - SLC HEAD has contacted a great looking florist in Sacramento who is going to see what they think is possibke for a shiny P tribute for Pat. We should hear back about that on Thursday. Josh / SLC HEAD and myself had a catch up over skype at the weekend to plan the logistics so I think we're on track. We thought that whatever money is leftover we will donate to the PUTS mentoring scheme (on puts.band). I know Thes has a separate donation fund for suicide prevention, but we thought this would be something Pat would be down with. and a link to a draft PDF so far. If you have any comments / anything you want to include or remove, let me know! Aye, cheers Po - Pat would be proud. EDIT: Just saw my other post in the test images. That's totally fine if its already done. If you can use the version above and the image of Pat holding the box of records, that would be amazing. Thanks again for all your hard work on this project Po, we all really really appreciate it! Pat would approve I'm sure, it's been said before, but if he knew how much he meant maybe he could have held on and got through. Thanks djGUERRILLA - I'll put your quote and story and photo in the book. That's great! Here's my post for the memorial book. If it's too long let me know and I'll cut it down. And I'll send some money to you once I figure out my paypal account - haven't used it in forever. Also, not sure if I can just yet, but I would love to make it to Sacramento for the memorial service. I'll have a better idea next week, but if there's anything I can bring, get, pick-up in Sacto, or just help out in some way let me know. Pat was the reason I joined the forum. I had been a big PUTS fan for a few years, but it took a while before I actually joined. Not being a social media guy (never been on Facebook, twitter...etc), the idea of joining a fan forum didn't sound all that appealing. But I checked in on it from time to time to try and get updates on whatever PUTS was up to. And it seemed like every time I checked it out there was a long post by a guy named Sactown Connection detailing every single move PUTS was making. How did he know all this stuff? Was he stalking Thes and Double from Sacramento? No, it turned out that he got all that info from PUTS themselves! He had their cell phone numbers! He had been over to their houses! Seriously, can you think of anything cooler than being personal friends with your favorite artist? I can't. So I joined the forum, because obviously it was legit if a guy like Sactown Connection was running it, and I'm really glad I did. I was actually a bit intimidated at first because everyone in the forum had been a fan much longer than I had, but Pat made everybody feel welcome. He really set the tone for the positive atmosphere and genuinely friendly nature of the forum, and that's an incredibly rare and difficult thing to do in the internet age (I've since joined and quickly left a couple other forums for being decidedly unfriendly). Everyone's voice was heard. There were disagreements, but no put downs. It was a very comfortable and comforting place to be. And that was all because of Pat. Luckily, I had the chance to meet him in Sacramento at my first PUTS show. We had both shown up early and the venue wasn't letting people in yet, so we just hung out and talked for a while. I found out he's a huge movie fan, and we bonded over Vertigo being both of ours favorite movie. He said he loved the Before Sunrise trilogy and would buy anything from the Criterion Collection, and I also found out that he's a huge Ben Folds fan (we didn't quite bond over that one). But it just shows how soulful and wide-ranging a person he really was on top of his generosity, and he was easily one of the most thoughtful people I've ever met. I've been messaging Eimi and she first wanted me to say a big "thank you" to everyone on the forum. 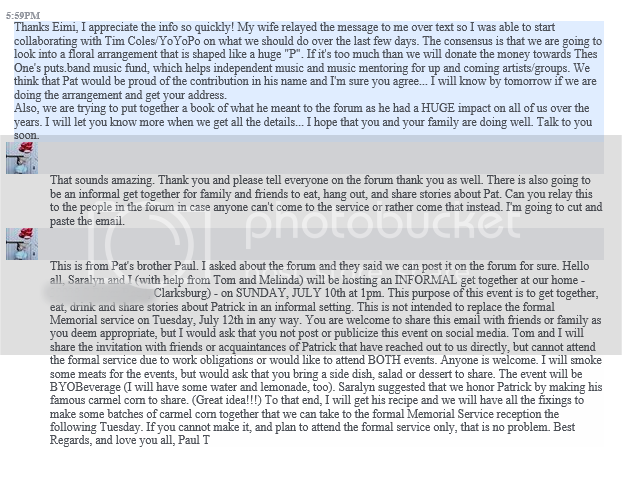 There is going to be a freinds and family get together Sunday 7/10 @ 1pm at Pat's brother, Paul's house. Eimi wanted me to share the info with everyone so I am copying and pasting from our convo... I have censored out the address as to not make Paul's home public knowledge. If you want to attend let me know and I will PM you the address. The layout looks great YoYoPo! Can't wait to see the finished product. I just sent some money for the cause. Please let me know if you received it from Martin Medina (esomedina@gmail.com) or if additional funds are needed. This is coming together so well but sad we are having to do it. The first draft looks great but I did see a spelling error in mine I wrote "go an email out of the blue" it should be "got an email out of the blue". If that could be change that would be great. Thanks again for sorting this out Tim & if I can do anything else or we need more funds. Please let me know. Hey YoYoPo, is it too late to submit our edits for the book? I made some spelling and wording changes and added a little bit. One thing is for sure: PUTS shows won't be the same without him and life won't be the same without him. He brought so much to so many and asked for nothing in return. Rest in peace and rest in power my friend. We all love you and miss you. Thanks guys. Not too late no. Wrapping it up this weekend. "...helping the guys out with different things like working setting up and tearing down the set, the merch table, taking photos/video, etc." "...helping the guys out with different things like setting up and tearing down the set, working the merch table, taking photos/video, etc."